Emission Control & Chemical Technologies (EC&C) developed the U2A™ technology (U.S. Patent 6,077,491) under a grant sponsorship from the U.S. Environment Protection Agency's Small business Innovation Research (SBIR) program. Hamon Research-Cottrell and Wahlco, Inc., are co-exclusive licensees of EC&C and have structured an alliance to provide U2A™ technology to utilities and other clients throughout the world. In the U2A™ process, urea solution is heated under controlled conditions to drive the thermal hydrolysis of urea to make a product gas containing ammonia, CO2 and water vapor. It is a once-through process in which the hydrolysis reactor comes to a dynamic equilibrium, providing a known constant mass flow and product gas composition. The U2A™ reactor is a kettle-reboiler style heat exchanger constructed to ASME code from 316L stainless steel. Heat is provided by a nominal 150-250 psig steam supply. Reactors typically operate at 80 psig and 300°F and are sized to match client requirements for ammonia. The urea hydrolysis reaction proceeds from urea solution (excess water) to ammonium carbamate (NH4COONH2) to ammonia, CO2 and water vapor. The overall reaction is endothermic and easily controlled. A demand signal based on NOx control requirements regulates the flow of ammonia gas to the process via a flow control valve. A level controller adjusts urea solution feed to maintain constant liquid level in the reactor. A constant gas pressure of product gas is maintained by controlling the steam input to the heating coils. The U2A™ system is a simple and logical alternative for ammonia supply systems to meet increasingly stringent NOx emission regulations. The only chemicals required are urea and water. Like ammonia, which is the necessary reducing agent for both SCR and SNCR, urea has achieved commercial acceptance for NOx reduction. Traditionally, utilities operating or planning to install SCR systems could choose between anhydrous (pure liquefied ammonia) and aqueous (19 to 29% solution) ammonia as the reagent source. However, anhydrous ammonia is regarded as a highly toxic substance subject to strict OSHA and EPA regulations. Aqueous ammonia, though less concentrated, poses similar risks. And increasingly, the risks associated with the transport, storage and handling of ammonia have prompted local authorities to place additional restrictions on the use of ammonia. For large SCR installations, problems and risks are magnified. For example, using aqueous ammonia drives up power costs and requires substantial storage facilities. With the U2A™ system, however, urea is the feedstock chemical to provide ammonia as needed to an SCR system. Urea is a stable, non-volatile and environmentally benign material that can be safely transported, handled and stored with such risks. Compared to aqueous ammonia systems, the U2A™ process has lower operating costs. Available data also shows that all mixtures of the U2A™ product gas with air are non-flammable. 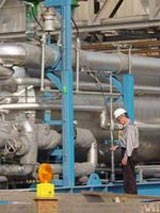 Operating experience indicates that the small amounts of formaldehyde, present in the urea, do not accumulate in the reactor, but are driven off to the flue gas stream where the SCR catalyst oxidizes it. In addition, the U2A™ system does not form unwanted byproducts. The Alamitos U2A™ system was a complete success. The project not only confirmed the technical viability of the U2A™ system in a commercial application, but also proved that it is an economically attractive, reliable and a safe alternative to ammonia for post-combustion NOx control strategies. The reactor, sized to produce a nominal 400 lb/hr of ammonia (for two boilers) of and to consume up to 1,768,000 BTUs/hr steam, operated for approximately 1500 hours from October 2000 through January 2001 over a range of 50-280 lb/hr of ammonia (for one boiler) following system in automatic controlled operation to meet SCR process demand. Overall turndown of the system was achieved across a better then 20:1 range. During very stable operation, fully compliant NOx reduction ranged from 87% to 98%. In side-by-side tests at full load, the U2A™ system also demonstrated equivalent performance vs. the original aqueous ammonia system in place in Alamitos. The U2A™ reaction kinetics, well understood at the pilot scale, were confirmed with full-scale operation (400:1 scale up) at Alamitos. Operating time at Alamitos was sufficient to allow for quantitative and qualitative analysis of the expected residual from trace-suspended solids in the urea solution feed. This analysis, together with physical inspection, confirmed the suitability of materials of construction, the calculated requirements for periodic blow down (annual or semi-annual) and the absence of accumulated organic materials in the U2A™ reactor. Based on the success of the Alamitos project, AES contracted Hamon Research-Cottrell and Wahlco to transfer the reactor and technology to the company's Huntington Beach Station Units 1,2,3 and 4. A second U2A™ reactor has been to bring total ammonia generation to 800 lb/hr. to serve the SCRs on the four natural gas-fired units rated at 450 Mw each. Huntington Beach started commercial operation in July 2001. Hamon Research-Cottrell and Wahlco have since been awarded several contracts from utilities for U2A™ systems providing more than 20,000 lb/hr or ammonia capacity and serving nearly 10,000 MW of utility generating capacity. © 2019 EC&C Technologies, Inc.